If you have a missing a tooth or need to have a tooth replaced for any reason, you definitely should consider a single dental implant. This simple treatment is the very best way to fill the gap in your smile. The process begins with the dentist drilling a small hole in the jaw. Into this, a surgical-grade titanium post is inserted. The function of the post is to serve as an anchor for the structure. The post is threaded like a screw because the grooves make the fusion to bone simpler and less time consuming. Next, an abutment is placed on top of the post. This is the portion of the structure to which the crown is affixed. At Adult Dentistry of Ballantyne, crowns are made of porcelain due to its many advantages. Porcelain is extremely strong and has comparable wear patterns to natural enamel. With single dental implants and porcelain crowns, people are able to eat and talk effortlessly. Single dental implants are superior to standard tooth replacement methods in several important ways. Unlike dentures, which may be loose-fitting in the mouth, single dental implants are a permanent fix for missing teeth. 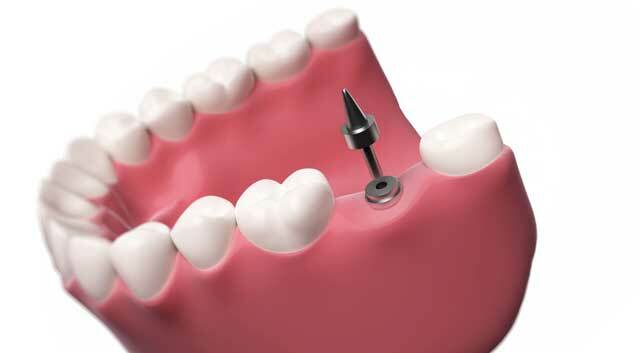 Since they don’t move, single dental implants are much sturdier than dentures and bridges. They seem more natural for chewing and speaking. The structure of single dental implants makes them the strongest tooth replacement available today. Eating a candy apple or corn on the cob is no problem with a dental implant. When teeth are missing, the underlying bone has a tendency to weaken. The titanium posts prevent this from developing. A single dental implant with a porcelain crown can be made to look nearly identical to the color and luminescence of the surrounding teeth. There is no longer any reason for you to endure the pain of a bad tooth or to sacrifice your smile to a missing tooth. Single dental implants match the appearance and feel of your natural smile. They require no unique cleaning, aside from brushing or flossing, and most patients can’t tell the difference between the feeling of implants and their natural teeth. Dr. Robert Harrell is committed to giving you the most effective results possible. If you are ready to smile, eat and talk with confidence once more, call Adult Dentistry of Ballantyne today at 704-541-9888 or use the contact form on this page to schedule a free, no-obligation smile assessment. At your exam, a digital smile preview will be created at no cost (an $85 value) to show how your smile will appear when your therapy is finished.